Jim, Chewie, and I set out on another adventure midday today after Jim got a little bit of work time under his belt. 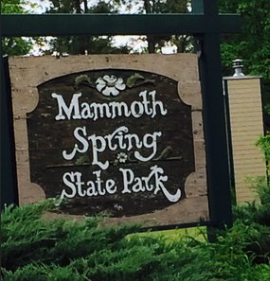 Loaded into the car, we pointed it north, making our way to Mammoth Spring State Park. The park, located in Arkansas, borders the Arkansas/Missouri state line. This spring forms the head waters of the Spring River with an average water flow rate of 9.78 million gallons per hour at a constant temperature of 58 degrees Fahrenheit. The spring is the result of a convergence of many underground tributaries into one main channel that brings the waters of the “high plains of Missouri” south and finally comes to the surface some 80 feet below the water level of the spring pool inside the park. It has been designated as National Natural Landmark (Arkansas Mammoth Springs State Park Brochure, 2014). Those are the facts in a nutshell, but it is the beauty of the park that appealed to us. Due to some road contraction near the park and the fact that we were looking for a BBQ place to grab something to take to the park for a picnic, we drove past the entrance twice without realizing it. It took a third try for Jim and I to realize the beautiful lake and grassy areas around it was actually the place we wanted to go. 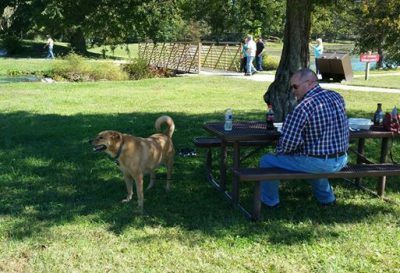 Picnic tables are placed under the shade of nearby trees on one side of the spring pool that bursts forth, flowing to either side of a raised area of land, to form the head waters of Spring River. After some really good BBQ from a local place about ¼ mile or so down the road from the park, the three of us walked around the lake, over the dam that at different points in time provided power for a mill and later a hydro-electric plant, past active railroad tracks (a train pasted while we were there, and a train depot turned museum. It was a lovely lunch and afternoon in the park. Added bonuses today were the beautiful drive and the discovery of another small town to which Jim and I can’t wait to return to explore: Hardy, Arkansas. Here are some more pictures from our day’s adventure. We hope you enjoy them! Click on a photo or hold your cursor over it to read the caption.